When I first saw this Fancy Pants paper at CHA I knew it had to be in a kit. I loved the bright colors and whimsical patterns. Honestly though, I really had no idea how I would use it on a layout since it was so busy. This afternoon, I finally had time to play with this paper and this is what I came up with. After using this paper, I have a few tips for making this busy pattern work for you. 1. Use a black and white photo. The B&W photo doesn’t add any more color to the page, so it’s less distracting. 2.Create layers with “calmer” papers. Here I used the green grid and blue grid B-sides of the paper. 3. Trims the swirls. I really loved the swirl design in the paper, but since they took up pretty much the entire center of the paper, they had to be covered. I decided to trim the swirls with my craft knife so that I could still see them and use a larger photo in the center of the page. Everything on this page is from our April kit. One last note, I ran out of the “s” on on my puffy alpha sheet, so I just trimmed it from this fun paper. I like how the combined fonts turned out. Glad I was out of the puffy blue S! The full photo and info on our May kit, Simply Delightful, is now up. We hope you are excited about it. This kit is SOLD OUT, so hopefully you got one if you wanted it. We do have a waitlist, but we are not currently taking anymore names for it. We will let you know if any spaces become available. All new subscriptions will start with our June kit. Here’s a look at another layout I did with the May kit. 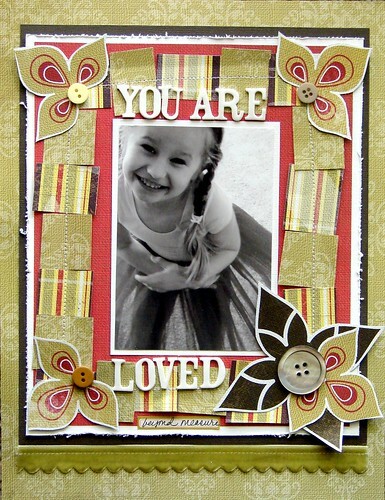 have you ever wanted to make an embellishment such as ribbon stiff? or have you ever wanted to use a piece of fabric as a back ground to your layout? Try stiffen stuff! (I know I sound like an infomercial!) This stuff is great–I will admit that it has been a while since I’ve used this product (I use to use it when I cross-stitched), it is amazing! You spray it on and when it dries your project is stiff–the best part is, it dries weird you can we wet it and try it over again! Here is a fantastic and easy tutorial from Rita at CoffeeShop to create your own blog header. Enjoy! One quick layout I did this afternoon with the kit. I must say I am loving the rub-ons! Lots of images and they glide right onto the paper. Lots of paper options in this kit since they are all double-sided sheets. The MAY KIT is SOLD OUT. There is a chance that one will become available. If you would like to be put on a waitlist for this kit, please email us. Okay, ladies, who’s with me? Diana posted a GREAT challenge for April called the “Whatever” challenge. You can read all about it in the the Challenge section of Scrapbook Circle’s Community. But the basic idea is to blindly grab supplies, add photos (these do not have to be selected at random, lol), and scrap a layout from “whatever” you grabbed! I went to one of my embellie sorting bins and my patterned paper scraps and grabbed a few things. Then I picked up the closest stamp folder and 2 punches I just used today (also where the seed packet came from… we made flower pictures and planted sunflower seeds today with the 4/5 year old Moppets). So, here you have my “whatever” supplies. I still need some ink and my photos. By next week, I will have scrapped a layout and loaded it to the Photos section of the community. Let’s see what you can do! You have until the end of April to join in the fun and have a chance to win a fun RAK Bag prize! this is a really quick fun idea…. sand your cardstock! It it’s textured it gives detail and changes the color a bit. It’s especially fun when you have a cardstock who’s core is a different or coordinating color such as core’dinations paper. Enjoy! I stumbled upon two really GREAT blogs recently. I have used them and enjoyed them so much, I wanted to share. The first one has some really fabulous tutorials, plus Julia is incredibly talented. You can check out her blog Bella Papier here. If you like editing photos and love photo actions, you have to check out CoffeeShop. I have purchased many actions and CoffeeShop’s are top notch, not to mention free! I use PSE6 and a lot of photo action creators cater only to PS. Needless to say, I am over the moon to have so many incredible actions to choose from. Rita also has a flickr group where you can check out her actions people have used on their photos. I created a couple of LO’s using CoffeeShop photo actions on my pictures. Unfortunately, blogger will not upload them to the SC blog. If you are interested in seeing them, you can hop over to my blog to check them out. I hope these two blogs inspire you as much as they do me. Have a fabulous weekend ladies! Meet Our New Scrapbook Circle DT! I am very excited to share our new design team with you. We had so MANY talented ladies apply for our design team. This decision was not easy. Everyone who applied had so much they could contribute to Scrapbook Circle. After many hours of careful consideration, we have chosen 4 new talented ladies who are ready to join our design team. Here I’ll share a layout for each of them and a link to their blogs so that you can start to get to know them. I’m looking forward to May when we will get to see the work of these talented new ladies! I can’t end this post without saying a HUGE THANK YOU to Candace, Marcee, Jen and Jennifer for everything they have done and shared with us over the past many months. I feel truly blessed that they have been here sharing and creating and bringing such a positive vibe to Scrapbook Circle. You ladies are absolutely AMAZING! Thank you for everything. Just wanted to share a quick layout I did for MPCo. with you…for fun I used my scraps up for this layout just by cutting random squares (not perfectly cut) of my paper and stitched along the middle of each square for a fun border surrounding my photo. 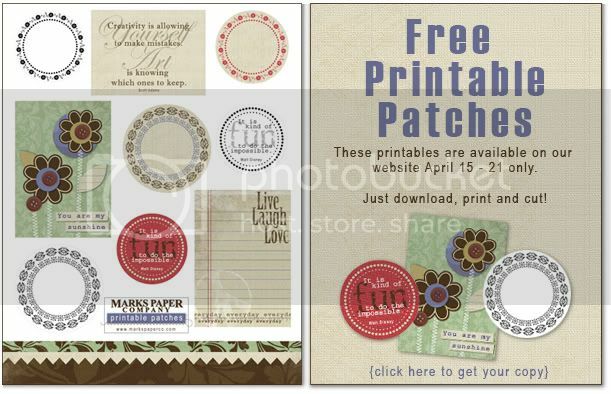 Also wanted to share that starting April 15th (today) through the 21st you have access to some FREE printable patches on the Marks Paper Company site (here). And then, while you are over there, check out the blog for an AWESOME challenge that is being hosted by Patty this month…hope you decide to participate as the prizes are pretty darn cool!